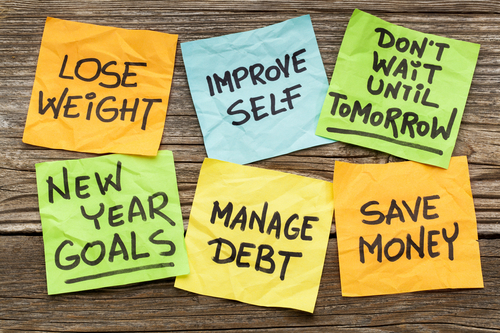 After working on your 2016 goals for the first two weeks of the year, it may be time to take a step back and evaluate how well you are sticking to your resolutions. If you are finding it to be a challenge, there may be a need to do some troubleshooting and see if you are taking the necessary steps to assure success with meeting your goals. The tips below will provide you with a guideline that make each task feel more achievable. 1. Choose your top priorities. Most of us have a laundry list of resolutions we would like to work on. The problem with this is that finding the time and energy to work on multiple resolutions is a challenge. Choose resolutions that are meaningful to you and that will have the greatest, positive impact on your overall well-being. 2. Set long term goals. Make sure that you define exactly what you want to achieve. Be specific with your definition. For example, saying that you are going to exercise more is not very measurable and is too vague, which can easily result in giving up or straying from the plan. Instead, say that you are going to exercise, for example, for 30 minutes at least four days per week. 3. Set short term goals. Breaking down long term goals into shorter term goals will allow for more immediate progress to be observed. When we see progress we are less likely to give up. Additionally, setting benchmarks makes tasks more doable. Take for example the resolution to do more physical activity. A long term goal of running a marathon is much more daunting than a short term goal of running five miles. 4. Devise a plan with specific days and times to work on your goals. Be organized. Take a few minutes at the start of your week to map out a plan and build time into your schedule to work on your resolutions. To do lists, planners, and calendars on your smart phones are just a few of the tools you can use to keep yourself more organized and focused. 5. Enlist others as a source of support. It is no secret that having support from those who are important to you will positively impact your performance. Support systems will encourage you to not give up and will reinforce your achievements. Celebrate your successes. If you gave up smoking, use the money that would have been spent on cigarettes to buy yourself a new pair of shoes or a trip to the movies. Many of the resolutions that you set can be difficult to stick with and acknowledging your accomplishments with small rewards will help keep motivation levels high.